From values learned as a child in rural Georgia to the Carter Center’s work to end sexual slavery, former President Jimmy Carter explored “moral leadership” in a Feb. 12 speech at Candler School of Theology. Photo by Lisa Stone. 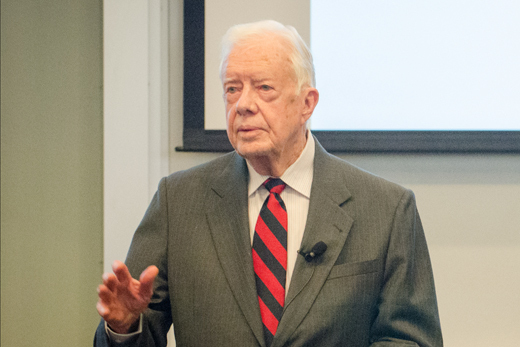 From values learned as a child in rural Georgia to The Carter Center’s ongoing work to end sexual slavery, former U.S. President Jimmy Carter shared formative experiences and common threads from his leadership narrative in a recent speech at Candler School of Theology. Carter, University Distinguished Professor at Emory, spoke Feb. 12 to an audience of Candler students, faculty and staff as part of the James T. and Berta R. Laney Legacy in Moral Leadership. He opened by describing his early years in the 1920s and ’30s in the small community of Archery, outside Plains, Georgia, where his white family was a minority in a majority African American population. As he struggled to grasp the injustice of segregation, white ministers in Plains showed no sign that it was wrong. “The point I want to make to this group from Candler is this: I did not get any guidance from white preachers, who were not particularly interested in changing their own privileged positions,” he said. In fact, Carter said he counts five people as particularly influential in his life; three of those five were black. Their early influence on the development of what Carter calls “moral values” shaped his political career, as he focused his leadership on improving civil and human rights. Carter’s legacy continues today through the Carter Center, an institution that partners with Emory University to promote human rights and to alleviate human suffering. Carter closed his talk with a segment on one of the Carter Center’s newest initiatives: advancing the human rights of women and girls. Calling it “the worst human rights abuse on earth,” Carter decried the mistreatment and deprivation of women and girls around the world, noting that 160 million girls are “missing from the face of the earth” today, victims of gender-based infanticide. And he pointed out that “we have more slavery now than ever before,” with 60,000 people in America living in sexual slavery—including between 200 and 300 sold into slavery each month in Atlanta alone. In closing, he reminded the audience that they were on the forefront of creating change. “Ministers of the gospel are part of the cadre to stop this,” he said. Named for former Candler dean, president of Emory University and U.S. ambassador to the Republic of Korea James T. Laney and his wife, Berta, the Laney Legacy in Moral Leadership at Candler School of Theology enables students to cultivate effective leadership skills within their communities, as well as an understanding of the cultural and religious differences that now span the world. The Rev. Dr. Robert M. Franklin, Jr. serves as the inaugural Laney Professor in Moral Leadership.